Hospitals and trauma centers currently rely on donated live blood to help save patients. Unfortunately, this blood is often in short supply due to both availability and limited shelf life. Synthetic blood is a potential solution but one of the hurdles in development is finding a way to create artificial hemoglobin, the protein that carries oxygen through the bloodstream. A new study that analyzes what lets whales stay underwater for so long could provide the necessary answer. The study looked at myoglobin in whales and compared it to myoglobin in humans. Myoglobin is what holds oxygen inside muscles, as opposed to the bloodstream. 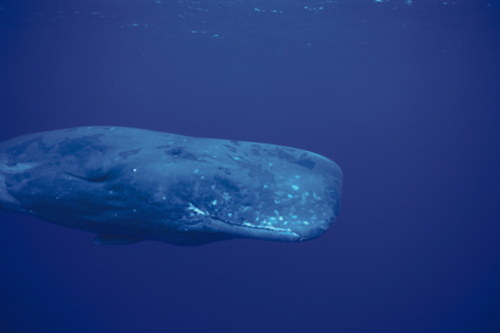 Whale myoglobin is able to hold oxygen for long stretches of time and periodically “injects” the muscles so that it doesn’t need to go up for air as often. A whale’s muscles also feature a much higher density of myoglobin than humans—which is why whale meat is always such a dark color. Since myoglobin can be used to create hemoglobin, it was hoped that understanding the nature of a whale’s myoglobin could be translated to synthetic blood development. What the researchers found is that the myoglobin in whale muscles is extremely stable and does not unfold as often as that in humans. Proteins fold into different shapes when they unfold. Since the shape of myoglobin between humans and whales is largely the same, the answer to the stability is likely to be found in the amino acids that form the protein. The intent is to create bacteria that produce myoglobin, which can be combined with heme to form hemoglobin. Since the stability of the myoglobin affects the yield amount of the bacteria, knowing how to get more stable proteins is of extreme importance. Samuel, P.P., et al., “Apoglobin Stability Is the Major Factor Governing both Cell-Free and In Vivo Expression of Holomyoglobin,” The Journal of Biological Chemistry 2015, doi: 10.1074/jbc.M115.672204jbc.M115.672204. “Deep-diving whales could hold answer for synthetic blood,” EurekAlert! web site, September 25, 2015. http://www.eurekalert.org/pub_releases/2015-09/ru-dwc092515.php.